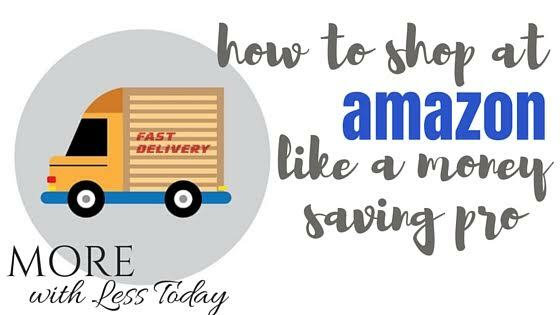 How to Shop at Amazon Like a Money Saving Pro With 25 Smart Ideas! 1.Gold Box Deals. Lightning Deals and Top Markdowns – Gold Box deals are valid for a day and Lighting Box deals are valid for a short time, usually a few hours until they are sold out. The Lightning Box deals will be for different categories throughout the day such as Health & Personal Care, Sports and Outdoors deals, and Software deals. I try to look at these first thing each day, especially when I have a gift to buy. 2. Amazon’s Warehouse and Clearance Center – You can find deep discounts on open-box, like-new and pre-owned items that are backed with Amazon’s return policy so you can be confident with your purchase. Look for Prime and free shipping when applicable. 3. Trade In Old Items for Amazon Gift Cards – Trade in items over 1,000 different items for an Amazon.com gift card. Options include electronics, movies, textbooks, video games and more. 4. Use “Subscribe and Save” for your reoccurring purchases to get discounts on thousands of everyday items, like laundry supplies and baby products. Not only will you get free shipping, but you can also save up to 15 percent on your entire order. 5. Try Amazon Prime for FREE with a one-month free trial. After once month, you can decide if the cost of the membership makes sense for you and then cancel before you get charged for the membership. You do need to enter a credit card to access the free month so write the ending date on your calendar and set up an alert so you can decide if you want to keep it or cancel right before your free month is up. 6. Choose no-rush shipping, and get shopping credits. Amazon Prime members who choose free no-rush shipping instead of free two-day shipping receive complimentary promotional credits that can be used toward future purchases. Once the item ships, you’ll receive an email with the credit’s details, including how to redeem it. 7. Try Amazon Dash for Prime Members for Free. Buy a Dash Button for $4.99 and receive a credit of $4.99 after your first press to place an order. With Amazon Dash, you’ll never run out of popular household essential items. The Dash Button is a Wi-Fi connected device that reorders your favorite product with the press of a button. Each Dash Button is paired with a product of your choice, which is selected during the set-up process. When you’re running low, simply press your Dash Button. 8. Try Amazon Restaurant delivery with your Amazon Prime account. There are no menu markups. 9. 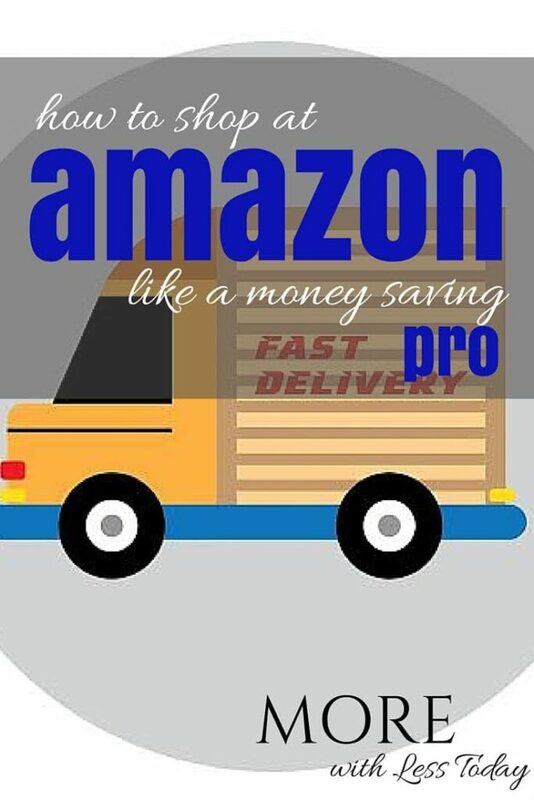 Amazon Family (formerly known as Amazon Mom) There are tons of benefits and savings in you are buying diapers and baby items. Anyone can join, the program was designed for caregivers. You will get good discounts on diaper subscriptions and free two-day shipping. Often they will have special coupons just for Amazon Family members. You can get a free 30-day trial and after the 30 days, you can continue to receive benefits if you join Prime. Never running out of diapers and having them delivered to your doorstep is a very good idea. 10. Share your Prime account – visit the Amazon Household page and share your Prime account with your spouse, partner or kids. 11. Get a Prime Student account. If you’re a college student, you can sign up for a free six-month trial of Amazon Student, which offers free two-day shipping, access to unlimited photo storage and other benefits. After your free trial ends, you’ll get upgraded to a Prime membership for half the cost. You can also earn $10 simply by referring someone. Don’t forget to check Amazon for your textbooks. I’m told by my savvy college age readers that Amazon.com prices for books are very competitive. 12. Use Filler Items to Avoid Paying for Shipping – If you are not a Prime member and your order does not qualify for free shipping, consider adding needed grocery items, pet food, cleaning supplies or other household items until your order qualifies for free shipping. 13. Find cheap add-on items on tons of everyday items including toilet paper, vitamins, and toiletries. Look for the Add-on Item logo while shopping on Amazon.com. Add-on items must be part of an order containing $25 of items shipped by Amazon.com (inclusive of the Add-on items and including items sold by other sellers that are shipped by Amazon). Your order can include a mix of Add-on items and other items shipped by Amazon, or be entirely made up of Add-on items. 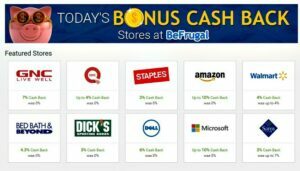 Ebates and BeFrugal are two cash-back reward sites for your online purchases. I use both of them and chose the one that is offering the highest percentage of cash back on the day I am making an online purchase. If you simply log in to Ebates or BeFrugal first and then chose Amazon, you can get between 3% – 7% back on your purchases, (sometimes even more) depending on what you buy and what promotions they are currently offering. Get a $10 cash bonus free just for signing up with Ebates. Once you earn your first $25 from your online shopping, your $10 will be added to your payment. 15. Earn Free Amazon.com Gift Cards with Swagbucks. I have been using Swagbucks since 2011 and regularly earn free gift cards just for searching the web–something we do anyway. It is a very easy way to earn gift cards for Amazon.com and hundreds of other stores like JCPenney, Lowe’s, Barnes & Noble, Target, and Starbucks. Learn more and start earning too with Swagbucks. 16. Amazon Has Grocery Coupons – Find organic and healthy food along with common grocery items. You will often see a paperless coupon to check before you place your order, nothing to clip! Look for savings on organic food, gluten-free food, and healthier food options. 17. Create an Amazon Wish List then share the items in your wish list and get what you really want for your next birthday, anniversary or special occasion. You’ll make it easy for the gift buyer and you won’t have to return anything or get duplicates. You can also create a wedding registry, baby registry, school list, kids’ birthday, and friends and family gifting list. 18. Price Matching and Price Protection Policy – Amazon will price match certain items such as televisions and cell phones. If you purchased a TV on Amazon but within 30 days noticed another online retailer is selling the same item at a lower price, contact their customer service. You will have to provide them with the competitor’s information and then ask them to price match the TV. If Amazon lowers its own price within 30 days, ask to be refunded the difference. Your mileage may vary on this, but it is worth it to ask. 19. Use a price comparison browser plugin. To make sure you’re getting the best price on an item, install a price-checking plugin, like PriceBlink.com. It instantly checks prices at other retailers to help you find a better deal. 20. Buy used – there is a good selection of used goods that you can buy from third-party sellers. Save on the item you want by checking out the used options. Be sure to pick the reseller carefully and factor in the shipping costs to the total. In the search box, type in the name of your item and then add the word “used” to your search. 21. Camel – Camel- Camel – This is a free price tracker site. Set up a price watch and get an email alert when the price drops.You can also search the price history to research the best prices. Look under popular products to see current price drops. 22. Write helpful reviews and get free stuff. Get on the radar of the Amazon Vine program. The program was created to provide customers with more information including honest and unbiased feedback from some of their most trusted reviewers. Amazon Vine is an invitation-only program. Vine Voices are selected based on several criteria, but primarily on the helpfulness of their reviews as judged by all other customers and by their demonstrated interest in the types of products that are featured in the program. Customers who consistently write helpful reviews and develop a reputation for expertise in specific product categories are most likely to be invited into the program. If you bought a book on Amazon.com, go to Kindle MatchBook and also get the Kindle edition. For thousands of qualifying books, your past, present, and future print-edition purchases now allow you to buy the Kindle edition for $2.99 or less. Only books purchased online, sold and fulfilled by Amazon.com qualify. Find free books to download to your Kindle or device. My post, Find Free eBooks is updated each day, Monday – Friday. Download your free books now and enjoy them later. 24. Get FREE or cheap music – I update my Free Music You Can Download Today post several times a week. It’s fun to discover new music and new genres, especially when it’s free. When you go to download free music on Amazon, you’ll find hundreds of songs that range from traditional to contemporary in style. Whether you like jazz, pop, classical or reggae, or music for your kids to enjoy, there is something for everyone. If you want even more music to download, try a 30 day free trial of Amazon Music Unlimited. 25. Try Amazon Home Services . Find a local handyman, house cleaner and more from this new service. If you have something to sell, look into selling it on Amazon. I know several creative people who are designing and selling T-shirts on Amazon and are doing very well. Check it out! Share this money saving post with your friends and family. You can use the share buttons on the top or bottom of the post for easy sharing. Everyone loves to save a little money by shopping smarter! Do you have any additional tips to Shop Like a Money Saving Pro at Amazon.com? We would love to hear them! Another way to save is to comparison shop. Try the pricezombie browser extension to see price history charts at most major retail stores. Even if you shop just amazon, it’s useful because you can contact amazon reps to get them to price match when the extension tells you an item is available elsewhere cheaper. Amazon right now, for me, its the best to buy things on! If you are using Amazon Subscribe and Save you have the option to skip items during a delivery cycle. Keep an eye on the prices of your S&S items. Prices can go up, and these items are no longer a better deal, than if you purchased them locally. You can keep them on your scheduled delivery and if the price the following cycle, is cheaper, then purchase multiples.